Start your year off on the right foot by getting your systems dialed in so that once the busy season picks up, you can still maintain your momentum & feel/look super professional! I use 17hats. It allows me to create a consistent workflow for each wedding and engagement client. 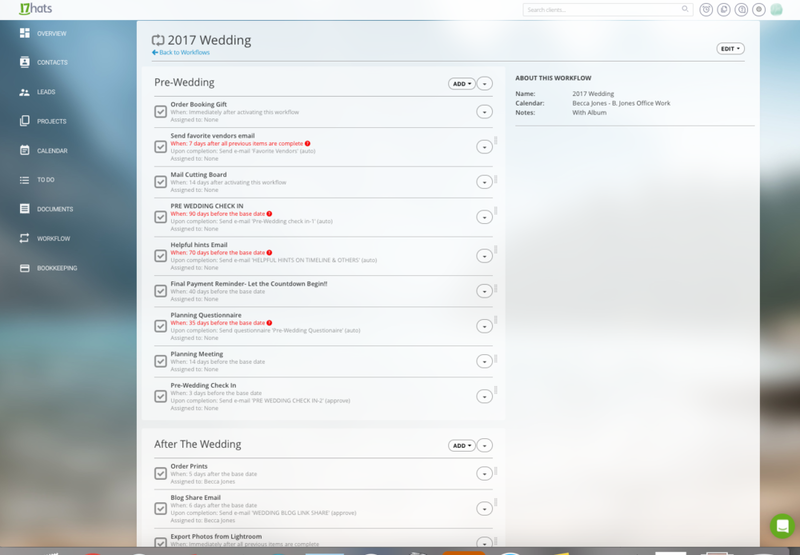 Below is the workflow I used for all my 2017 weddings. I have email templates set with reminders to send them out at a designated amount of time prior to their wedding. For example, every one of my couples receives a series of planning tips emails 6 months, 3 months, 1 week and 3 days before their wedding. Providing this planning information helps set expectations for their wedding day and ensures we're both on the same page. Here's the template for the email I send out 3 months before their wedding day. I just wanted to check in to see how things are going with the wedding? If you have questions about anything, please feel free to reach out to me. I'm here to help! Within the next few weeks, you will start getting additional helpful hints from me. They will help you to achieve the perfect timeline for your wedding, reduce the stress typically associated with family photos, and many other helpful tips. Please be on the look out for those emails! Again, please feel free to contact me if I can be of any help! Previously I was using the bookkeeping options available within 17hats but found their available reports to be lacking. Quickbooks small business has this neat feature that offers insights into what to expect to pay on your taxes based on your current income & expenses. I still hire a professional CPA to do our taxes because our finances/investments are pretty darn complicated and going DIY is too intimidating. What I love best about this bookkeeping system is that it is EASY. I sync my business credit card & checking account info and it automatically pulls all my transactions into the system daily. Every few days, I'll go in and categorize a few transactions and that's it! At the end of the year, I hand my accountant a few reports available through Quickbooks and I don't have to do anything else. SO GREAT. It also has the added benefit of offering a mobile app. As a mom, finding time to sit in front of the computer to work is a commodity! So being able to do bookkeeping from my phone in the playroom while the kids do their Legos is a huge win! I use Tailwind to schedule all my pinterest & instagram posts. I feel like Pinterest is sort of an under the radar way to reach brides that isn't super saturated with a bajillion other photographers. I received 6 wedding inquiries from brides who found me on Pinterest last year and 3 of them ended up booking me. #WINNING I recently started using Tailwind and boosted my Pinterest reach from 75,000+ to 105,000 in a month. I also use it to schedule my Instagram posts. One of my favorite features about Tailwind for Instagram is that it suggests relevant hashtags and then ranks them to let you know whether they a Niche, Oversaturated, Ok, Good, or Great.